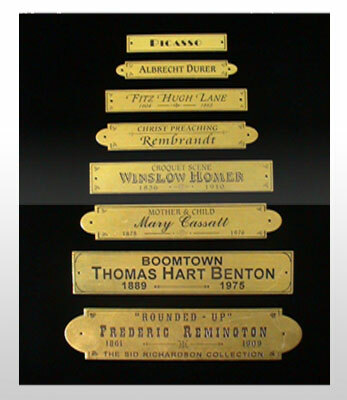 The Gold Leaf was started with the love of lettering and the tradition of hardwood title plates. The quality of workmanship has continued since 1983 and clients of The Gold Leaf have come to expect a product which will enhance their elegant work of art. The Gold Leaf's clients include some of the most prestigious museums, galleries and collectors in the world. The Gold Leaf has been featured in newspaper, magazine and television stories and has been recognized as producing one of the best products of the year, for several years in a row, by a leading art business publication.